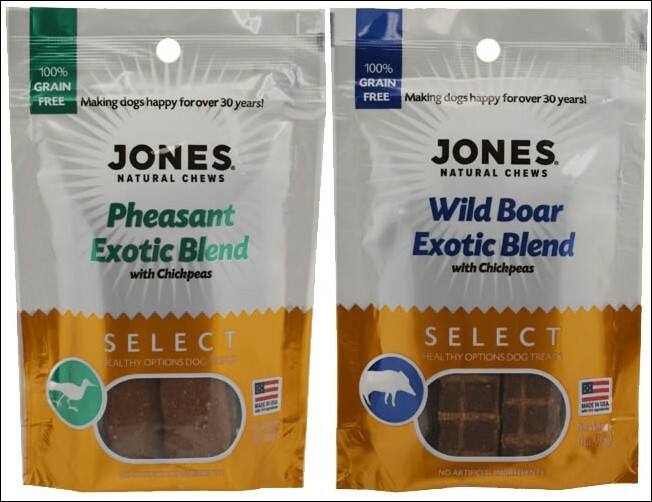 Jones Select Exotic Blend Treats contain over 70% high protein along with natural and nutritious ingredients, including chickpeas. They’re packed with protein and flavor that dogs crave. Made with the finest natural ingredients, Jones Select Exotic Blend is a wholesome treat that helps support your dog’s strength, health and well-being. These 100% grain-free treats are high-protein combined with chickpeas and other natural ingredients making them perfect for dogs who are fed grain-free or raw diets. Jones Select treats contain no chicken or poultry by-product meals and are made using natural ingredients with no artificial flavors, colors or preservatives.